Baby food days are in the past. I now face a pint-sized man who creates a challenge much larger than himself. Meal time. I’ve been working eagerly to develop meals and snacks our whole family can eat, while staying in the parameters of what Lincoln is able to chew with the few teeth he has. It can’t be too spicy, too crunchy, to hard, to messy or too bold. For years, my go-to breakfast has been Quaker instant oatmeal. It was always easy to bring to work and eat at my desk. 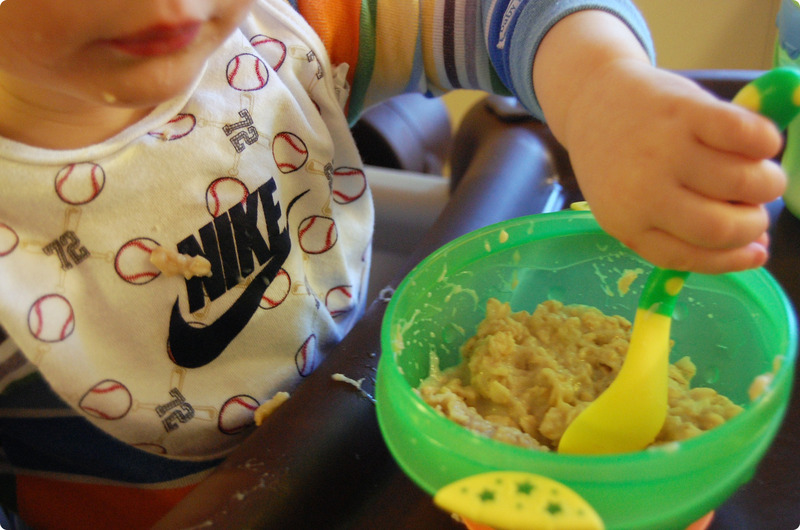 But as Lincoln started to transition from baby food to the real thing, he wanted to eat my oatmeal with me. I realized after days of hunger pangs by 9 a.m. that the half bowl of oatmeal I was eating would no longer cut it. I didn’t want to waste a whole packet on Lincoln, so I started making my own. And I tell you this: I will never go back! After a few days of practice, I finally had my recipe for banana bread oatmeal. Making homemade oatmeal takes much less time than I previously thought. This recipe is quick, easy and healthy. We both gobble it up! In a small sauce pan, mix together milk, brown sugar, vanilla and mashed bananas. Heat through to a low boil. Reduce to medium heat. Stir in oats, continuing until oats soften. If using regular old-fashioned oats, heat for approximately 3 minutes. If using quick oats, one minute will do. Remove from heat and serve. Top adult servings with chopped walnuts. Whether this is for you, your toddler, or both, I think you’ll find it a nice way to start the day! 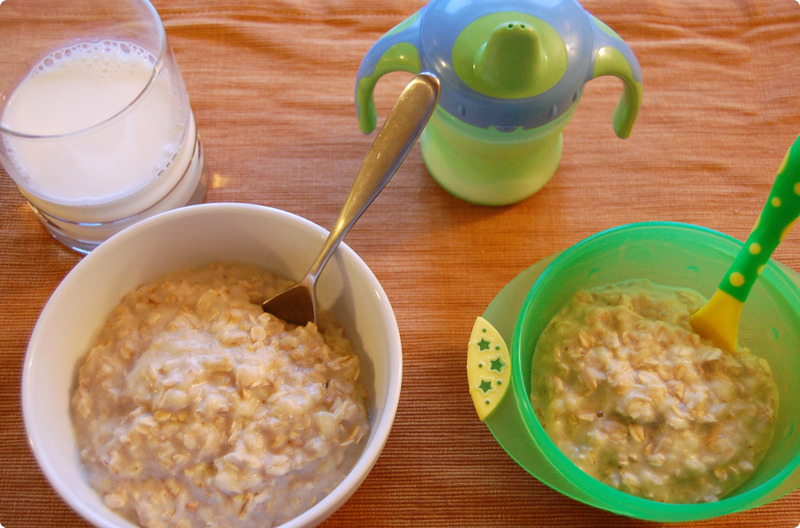 What do you feed your tiny tot for breakfast? Mmm, great recipe Stef! Along the same lines, we make overnight slow cooker steel cut oats – usually once per week – sometimes we add in flavor right in the slow cooker and others we make it “plain” and change up the flavors by the day. I absolutely love oatmeal and eat it almost every day! Love the idea of mashing up some bananas in it! We will definitely try this recipe out, as we are constantly trying to be creative with breakfast times. 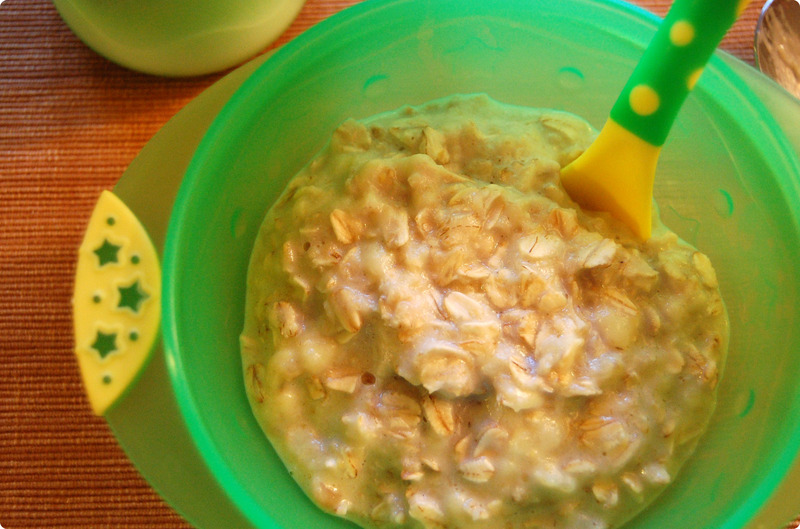 Your baby might be too young but we **LOVE** this project based breakfast. You need: a little milk in several cups, a paint brush, some food coloring and some bread. Color the milk with the food coloring. Let your child paint the bread using the milk paint. Toast. We use this on whole wheat toast and the serve it with some scrambled eggs and fruit. I grew up in a household with old fashioned Quaker oatmeal and I never understood why anyone would opt for quick oats instead … taste of the instant bagged stuff simply can’t compare. Oatmeal is one item I also thinks microwaves well. A sprinkle of brown sugar (or real maple syrup) and some raisins do the trick.